Are you a first-timer with Kanbanize? This guide will assist you to get started quickly in just 6 steps. The Dashboard is the entry point of your account. This is the place where all your Workspaces and boards are located. 1. The Workspace is represented by the blue ribbon on the left side of the window. Think of a Workspace as the environment that collects the Boards of different departments in your organization. To create a new Workspace-> click the Retractable menu (4) -> select "Add Workspace". Each Workspace has its own settings -> just click on the three dots icon that belongs to the right of the Workspace blue ribbon. 2. The Kanban board is the tool for mapping and visualizing each step of your process in the flow. To create a board use the "Add Board" icon to the right of the Workspace name. There is no limit for the number of boards you can create under a Workspace. 3. Widget - the "Initiatives in Progress" table to the right side of the Dashboard is an example of a widget. You can use widgets to see summarized information from your account at a glance. - View Reports - generate Timesheet reports to track the logged time spent on each task or a group of tasks. - Add Workspace - use it to create a new Workspace on your Dashboard. - Add Widget - add a predefined or custom widget. - Add Background - add a background or color your dashboard/ boards. - Manage Workspace Templates - save your Workspace and Boards as Workspace templates. The initial Kanban board view has three main columns: "Requested"(To Do), "In Progress" and "Done" to illustrate where each task is on the flow. The horizontal swimlanes are used to differentiate the type of work (design, bugs, technical debt, etc.). Each board is editable and you can adjust it to any process and team. To visualize the steps of your process flow, use the workflow designer via the "Edit Workflow" icon. 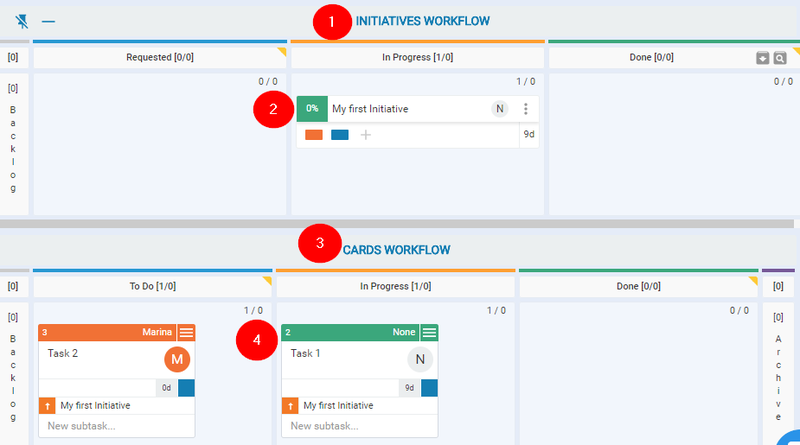 Note: By default, your Kanban Board consists of the Cards Workflow and the Initiatives Workflow. You can set the board to display either flow or both. 1. The Initiatives Workflow is the home of automated portfolio lanes, designed for Senior team members/Project managers to easily track the progress of bigger tasks or projects. Work items in this workflow are called Initiatives and they move through the workflow completely automatically when their child cards are moved anywhere in your account. 2. The Initiative is a Project/Feature/Epic, etc. and you have to break it down into smaller work items in the Card workflow, where tasks are to be processed. 3. The Cards Workflow is where all of the Kanban cards that your team works on live. 4.The Kanban card - is a representation of a work item. It carries information and details about the task itself, e.g. who is responsible for the task, title, and description, task priority, deadline, relevant attachments, etc. There are many ways to create a card in Kanbanize. You can use the default card view and the existing card properties. In addition, the system allows you to add extra card fields (custom fields) as well as to create card types and templates. The Cycle time is configured per board and it helps senior team members and Project managers to further analyze their processes via the Analytics modules in Kanbanize. To configure your cycle time, use the Board settings icon (the dotted icon) that belongs to every Board ->go to Configure Cycle Time -> use the Configure Cycle Time button. The Business rules (2) are automations that trigger an action that you define (create a card, move a card, update a card, send a notification, call web service, etc.) when a certain event occurs. A typical example would be to automatically move a card to a particular column or to send an email notification when the card's deadline is this week. Using the Business rules is an easy way to automate your processеs and implement the Portfolio Kanban management scenario. All Business Rules are available in the Administration Panel of your account. When you are ready with the initial Kanbanize setup, you can start inviting your team members to join the account. The Administration control panel is the area where the Account Owners manage new and existing users and their roles and privileges. If you need any help, you can find more guides in our Knowledge base or get in touch with our support and customer success teams. If you are on a trial and you need a demo use our live chat to book it.